Springhare is a mammal belonging to the Pedetes genus. Despite their name, these mammals are not actual hares but members of the Rodentia order. They are also known as Springhaas. This species is native to the southern regions of Africa. These mammals have well developed hind legs making it look like a small kangaroo. Size: These animals are of 14 to 18 inches (35 and 45 cm) in size. Their long tails add another 14 to 19 inches (36 adn47 cm) to their body length. Weight: Their average weight is around 6.6 lb (3 kg). Color: The upper body color ranges from reddish brown to cinnamon and pale grey. The lower body color ranges from orange to white. Their tails have a black tip. Head: The thick muscular neck supports their small head. They have large eyes and ears. Feet: They have strong hind feet with four clawed toes on each foot. The claws make the feet look like hoofs. The claws on the hind feet are broader than those on the forefeet. The Springhares are found in large areas of southern Africa. Their distribution range includes Tanzania, Kenya and southwestern Africa. 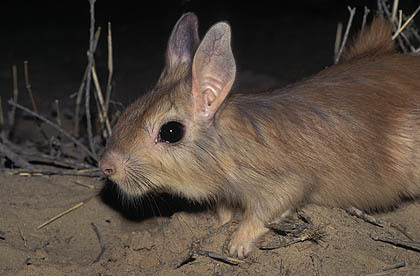 These small animals prefer dry savannas and semi-arid steppes of South Africa. They can be locally found in open fields of sandy soils free of large bushes and rocks. They live in smooth open areas because rocks and bushes make it difficult for them to leap long distances. They also live in cattle grazing areas as well as cultivation fields of oats, wheat, and barley. They usually make three burrows arranged in a circular manner. Their home range extends between 25 and 250 meters (82 and 820 feet) from their burrow. Springhares make their burrow near the largest bush or tree located within their home range. This species may extend their range to a broader area during droughts. The animals of this species feed on plant matters such as rhizomes, grass roots, corns, seeds, stems and leaves. They eat grasses with high protein and water contents. They also feed on fruits and berries of some plants. These rodents are fond of various grains like wheat, oats and barley. Sometimes, they also feed on small insects such as grasshoppers and beetles. They use their well developed hind legs to leap like kangaroos covering lengths of over 2 meters in a single leap. These animals are mostly nocturnal, rarely being active during day. They spend their daytime inside self-dug tunnels and burrows. These animals seal the entrance of their tunnels with soil and sand from inside. This species dig their burrows during rainy seasons as the soil remains wet and soft. Researches show that a pair of this species occupies different burrows on different days. These mammals are quite solitary in nature, preferring to live alone. They tend to retreat into their burrows when frightened. They make a whining noise when excited or sensing some danger. Sometimes they give a giant leap to leave their burrow. They use all four feet when foraging. However, they stand or sit upright on their hind feet while feeding to use their forefeet for handling the food. Springhares can travel 5 to 12 miles per night for the purpose of finding food and water during severe droughts. These rodents rest with their hind legs stretched forward. They bend their body forward between the hind legs with the flattish head-top and ears being in direct contact with the ground. Several animals like caracals, serval cats, genets, wild cats, mongooses, jackals and ratels prey on these animals. Even large birds such as large owls are also known to feed on these creatures. There is a tragus situated in front of the ears to prevent sand from entering in the ears when these animals are digging in the soil. Their long hind legs help them to move very fast in order to avoid being preyed on. 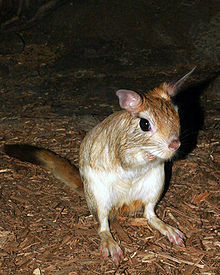 They are believed to be able to pick up vibrations by keeping the top of their head and ears in direct ground contact. The front legs of these rodents have curved claws that help them to dig. They have a keen sense of sight, hearing and smell which help them to detect any danger around them. This species is known to mate and reproduce throughout the year. They become reproductively mature at around 1 year of age. Their gestation period lasts between 77 and 82 days. Females can reproduce three times a year giving birth to one young at a time. There is a gap of approximately 101 days between two litters. The young are born in burrows. Unlike many other rodent species, the young Springhares are born with fur covering their entire body. Their eyes open three days after birth. They leave their mothers when they are 7 weeks old with a body weight of about 1.5 kg. This species have a life span between 8 and 14 years in captivity. Their life span in the wild is unknown. Housing: They should be housed in large cages as they need plenty of space to move and leap freely. It is advisable to keep them indoors. Their cage should resemble their natural habitat as much as possible. These rodents tend to destroy furniture and electric cord with their large teeth. So it is important keep them in cages and out of reach of these things. Feeding: One can feed them with grains, seeds, fruits and tubers. They are very fond of sunflower seeds. Tubers like carrots, potatoes and sweet potatoes are an important part of their diet providing them with their required fluid intake as they seldom drink water. 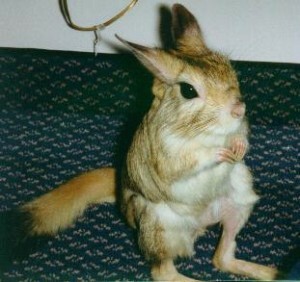 They can occasionally be fed with gerbil food or rodent chow. They can be provided with protein supplements after consulting an expert. Temperature: They cannot tolerate very low temperatures. So, it is advisable to keep them indoors away from cold. Handling: It is not advisable to handle them very frequently as they do not seem to like being cuddled a lot. These solitary animals usually prefer to stay by themselves. Temperament: Although they prefer to live alone, two or more Springhares can peacefully live together in a cage. 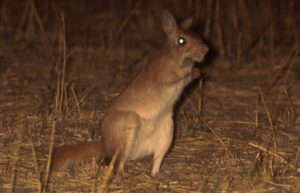 This species was included in the “Threatened” category by the IUCN in 1996 as their populations had decreased by approximately 20% due to habitat loss and hunting. But later in 2011, they were again included in the “Least Concern” category by this Union. They derived their name “Spring Hare” from their ability of bounding great distances. This species do not drink water throughout their lives. They only collect moisture from rain and dew. They can detect the slightest of vibrations of earth with the help of their keen senses. African Bushmen use these mammals for edible purposes.